The RingCentral virtual phone system can help your business look professional without sacrificing your personal privacy. Everyone knows that they SHOULD list a phone number on their ecommerce web site but most new business owners are hesitant to do so. Why? Well no one wants to receive calls from customers at home and to have to answer their home phone, Hi, Widget Enterprises, your friends would think you were crazy and someone might call in the middle of the night but setting up an entire phone line can be expensive and a hassle. Thankfully there is an answer in the RingCentral virtual phone system. Back in the old days my business was just me. I didn't want to increase my costs to much by adding a new phone line but I also didn't want my customers calling me at my home at odd hours. I stumbled across RingCentral and started using it. It's no longer just me and at one point I even had a regular business line to my home (which I eventually cancelled as I didn't need it) but I have never stopped using RingCentral. I can be on vacation at the beach, or out with my son and I just route the calls to wherever I am at. I've even talked to customers while at the store or in the car (I know thats illegal in California now unless you have hands free). The virtual system is just convenient since it can follow me anywhere. I can forward the phone to my employees at certain times of the day or I can set it to just alert me via email when someone leaves a message. It's infinitely flexible. We are an entrepreneurial family and last time my sister came for a visit she had 3 cell phones. She explained to me that each one was for a different business so she could answer the phone properly depending on which phone the call came into, ie one for each business. I asked her why don't you use a virtual phone system then you could have a single phone and you would just be able to tell when a call came in which phone it was to? She had never heard of such a thing before. 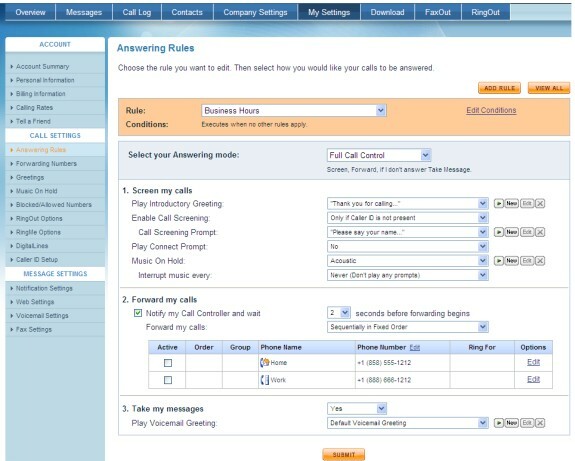 The answering rules are my favorite part of the RingCentral virtual phone system. The rules allow you to define different rules for different times of the day and days of the week. For instance you could forward calls to one number during the day but take messages automatically at night. You can choose the type of music to play for on hold. You can receive a notice of a new call on your computers call controller and then decide what to do with it, or any other myriad of options. The click to call feature allows you to add a button to your website where customers can just click and it initiates the call for them, ie it asks them for their phone number and it will call them and then connect you as well. This elimiates one step in the call process. 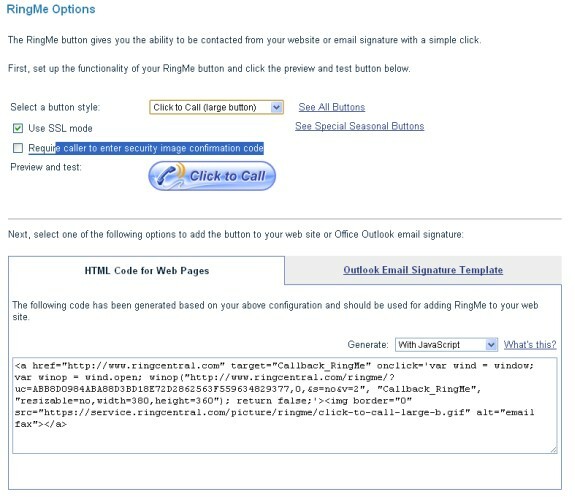 RingCentral provides a small html snippet that you can just copy and paste into your website and several button graphics. The call controller is a small program you run from your computers desktop. It can popup when you have an incoming call, alert you of new messages, show you recent calls, and you can initiate an outgoing call. I personally use the system currently only to take messages and then I get alerts of new messages via email and the call controller. I call customers back using the RingOut functionality to keep my phone number private. They also have apps for iphone, android, blackberry etc to help you manage your phone calls on the go. I've personally never used the mobile apps. Old habits die hard and when I started these didn't exist but maybe one day I'll break out the Blackberry and add their app. 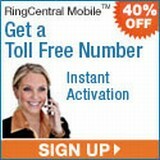 If you are interested in RingCentral signup for the free 30 day trial.